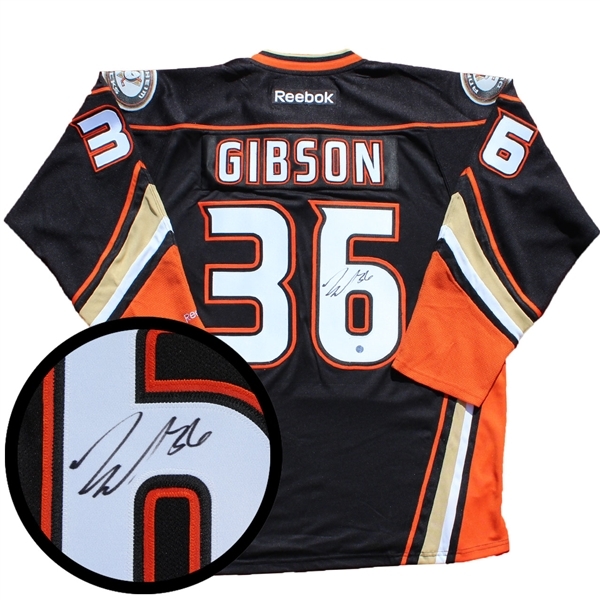 This jersey has been personally signed by Anaheim goaltender, John Gibson. Gibson made a statement in his first three games of his career posting a .954Save%, leading Anaheim to give him more games in the following season. Gibson was playing phenomenal and starting to take more games from starting goalie Fredrick Anderson, leading Anaheim to trade Anderson to the Leafs and promoting Gibson to their everyday starting goalie. Gibson just finished a career high year with a record of 31-18-7 with a 2.43 GAA and a .926 save%. The jersey is accompanied with a Frameworth hologram and COA to ensure the authenticity of the autograph. We do not guarantee any specific jersey sizes but we typically carry sizes L, XL or 52, 54 & 56 for Pro jerseys. These sizes are considered the most ideal for framing & displaying.